2017 US Open: Can Federer and Nadal face off in semis? FROM THE US OPEN –It is very unusual that there are five top-10 competitors who are unable to compete at the US Open. All of them are hurt, badly hurt, so it is possible that they won’t play for the rest of the year: Andy Murray, Novak Djokovic, Stan Wawrinka, Milos Raonic and Kei Nishikori. We could talk about it for hours; why are they so injured, why do they play too much, are they finally breaking down? We’ll leave that for another day, after the USO. Rafa Nadal is ranked No. 1 — which is great — but on the hard courts, he is very decent, but he is not spectacular. The Spaniard did reach the final at the Australian Open and IW, but he went to down to Roger Federer. Nadal has beaten the Swiss many times over the years, but this season, Federer’s backhand had improved a lot, so now, the lefty has to hit it harder. 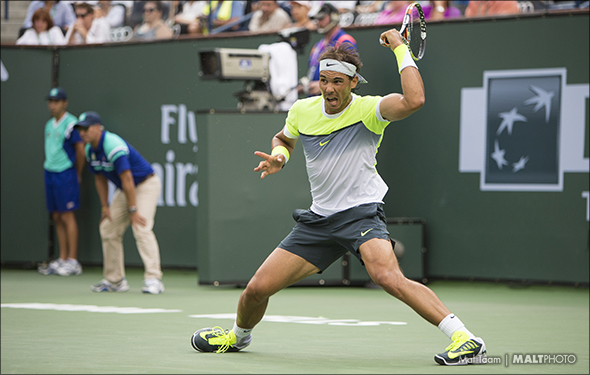 Nadal should be able to reach the semis, but it will be difficult, to say the least. Remember last year in the US Open, when he was up two sets to zero versus Fabio Fognini and, all of a sudden, the Italian got hot, and in the fifth set, Nadal panicked and lost. Now, he could face Fognini again, in the round of 16. That could be a fantastic match, except that while Fognini has played some terrific ball, but he likely will have to play Tomas Berdych in the third round — who is struggling — but a true veteran. Whoever wins, Nadal will beat them up, and in the quarters, he will face Grigor Dimitrov or Gael Monfils. Dimitrov just won Cincy, the first time won an ATP 1000, so he is extremely confident. He will out-hit Monfils in a long match, and then go up against Nadal. The Spaniard knows that he has to crush Dimitrov’s one-handed backhand. He will, but it will be super close. Nadal wins in a delicious five setter. Here goes Federer, who really wants to win the USO. The 19-time Grand Slam champion has played incredibly well, on the hard courts and grass. He has tremendous confidence, he can hit anything. However, just like Nadal, he has some tough draws. He might have to face the lefty, Feli Lopez, in the third round. Lopez loves to slice, he hits a big first serve and he will come to the net. But it doesn’t really matter, because Federer will figure it out, easily. In the fourth round, Federer will have to go up against Nick Kyrgios, who once again, is rising up. Assuming that he is healthy, the Aussie will be ready to rumble. He has beaten all the top players, so when he is into it, he can kiss the lines. However, in the fifth set, Federer will be patient, while the Aussie will over-anxious. Fed will move into the quarters, and it is very difficult to find out who will play. Maybe Juan Martin del Potro, Roberto Bautista Agut or Dominic Thiem. Throw in Thiem, who can really center the ball on his racquet, but he still hasn’t learned how to play on the hard court. Federer will in straight sets. This bracket is fascinating. There are three seeded American players — Sam Query, John Isner and Jack Sock — and two German brothers, Alexander and Mischa Zverev. Isner will face M. Zverev is the third round, which should be a string over very short points. Isner has finally started to play the right way for six weeks, and now he thinks he can get ever further at the USO. He has been around for many years, getting upset when he isn’t playing the right way. But now, he has improved his backhand and at the net — when he gets up there. M. Zverev is finally healthy, which is good, but he has trouble returning. Isner will face Querrey, his old buddy, in the fourth round. Querrey is rising again, with his forehand, his serve and, now, his return. They have hit with each other in practices hundreds of time. It really is a tossup, so pick Querrey, who is mentally sound. A. Zverev has already shown that he can beat just about anymore, upsetting Federer in the final at Montreal. He is very young, but he is a huge serve and swings so hard with his forehand and backhand. He should be able to beat Kevin Anderson and Gilles Muller. In the quarters against Querrey, it should be close, with amazing serves. The 20-year-old Zverev aces the American in the fifth set. Who knows will reach the semis? Maybe the former US Open champ Marin Cilic? The former No. 5 Jo Tsonga? The new, very young Denis Shapovalov of Canada? The good Frenchman Lucas Pouille? Even though Cilic was hurt last month, he looks OK. We think.